Owl is ready for bed. But as soon as he settles in, he hears a strange noise. He'll never get to sleep unless he can figure out what's going on! Let me start off by saying that I took a whole class in college just on Edgar Allan Poe, so the fact that this story was reminescent of The Tell-Tale Heart really made the story a bit...eerier to me. 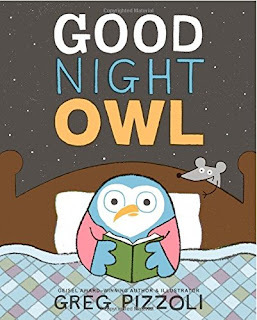 Really, I'm sure to the standard child reading this, it's a nice bedtime story about a silly owl who will do ANYTHING to figure out where that strange noise is coming from. It's funny, even! But to me and my Poe brain, it was creepy. And that made me not love it as much.